On Sunday, Sept. 11, Olympic gold medalist and Laguna Beach High School senior Aria Fischer and her alumnus sister Mackenzie were featured at a function hosted by the high school to celebrate their momentous achievement in the Rio Olympics. 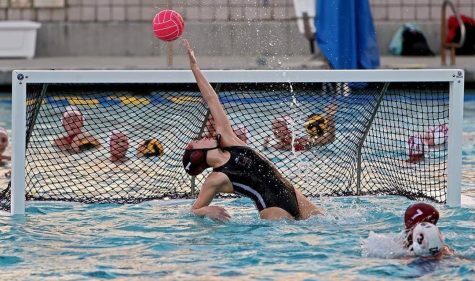 After a year of training and competing with the women’s national water polo team, Aria Fischer has returned to LBHS to finish her high school career. In order for Fischer to have made the national team and win a gold medal, she had to work hard, practicing up to six and a half hours per day. “I had a dream and worked hard to fulfill that dream. My national team coach also gave me opportunities early on to train against experienced girls who really helped my development,” said Fischer. Fischer experienced the Olympic games with wide eyes, taking in all she could during her time in Rio de Janeiro. “It was really cool being in the village, seeing the best athletes from around the world and witnessing successes of other athletes at the Olympics. All the USA athletes supported each other, and it was great to talk to athletes from other sports and learn their experiences and what their goals were for the Olympics and then get to cheer them on. We had a TV in our suite that had all the events going on live and when we weren’t training or playing games, we would cheer other athletes on even if we had no idea what their sport was about,” said Fischer. Fischer and her older sister Mackenzie continued the Olympic water polo legacy here in Laguna Beach that was started four years ago by LBHS alumnus Annika Dries when she earned gold in the London 2012 Olympics. 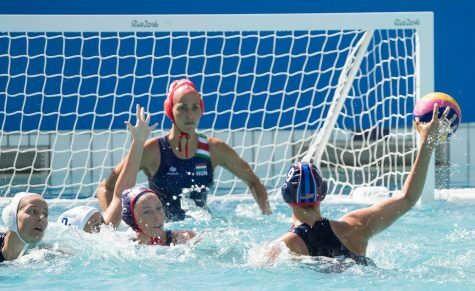 Experiencing and competing in the Olympic Games at such a young age has taught Fischer more about her sport of water polo. Additionally, Fischer relates that she was inspired by other incredible feats of athleticism she witnessed at the games, such as the record-breaking accomplishments of swimmer Katie Ledecky. “I think it is so cool she won her first gold medal at 15 years old and followed it up this Olympics with four golds and one silver,” said Fischer. Fischer’s focus and incredible work ethic have helped her earn her way onto the Olympic team. She is the youngest ever summer Olympic athlete to win a gold medal on a team sport. 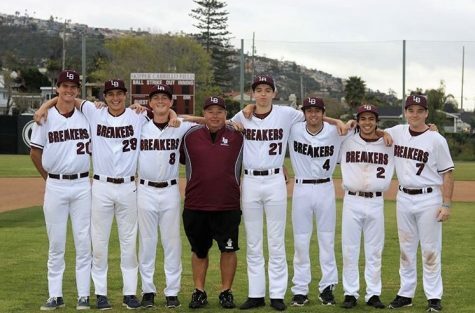 Before competing in the Olympics, Fischer played here in Laguna Beach, starting at a young age for the local club team and then on our very own high school team. Under coach Ethan Damato, she has won two consecutive CIF Division-1 titles. “Aria is a relentless and determined competitor both in games and in training. She may be the most determined person I have ever coached. That carries into the way she plays, the way she trains, the way she studies, the goals she sets for herself and really in all aspects of her life,” said Damato. Damato, who has coached Fischer since she was 13 years old, has witnessed her develop into the incredible athlete she is today. “I think what I admire most about her is the courage that she has to chase her goals and chase her dreams since I have known her. 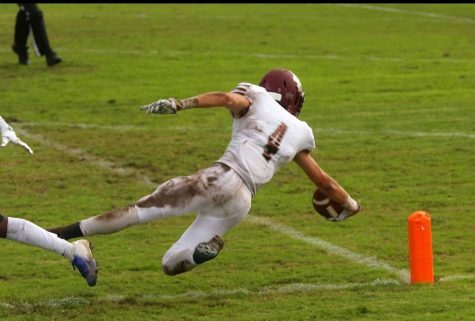 It’s inspiring to see one of your athletes put themselves on the line and truly chase their goals, chase their dreams. Aria has never been afraid of any challenges,” said Damato. This year, Fischer has returned to LBHS where she will finish her senior year and continue to play water polo for the Breakers. 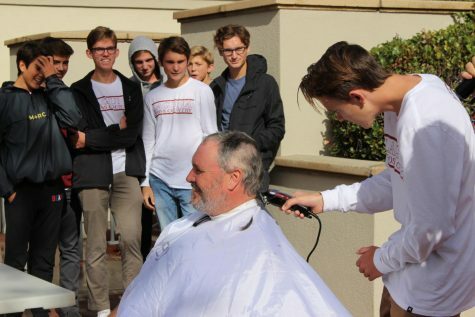 “It is difficult adjusting back to a normal school schedule, but everyone is very welcoming and helpful,” said Fischer. Outside of the pool, Fischer is a dedicated student and, having lived in Laguna all her life, a close friend to many students here at LBHS. “Aria is a lovingly sassy person outside of the pool who makes other people laugh and just have a great time around her. She’s one of my closest friends, and she is someone I know I can always lean back on. Aria is fiercely loyal to her friends and will fight—and most likely win—for any of her friends. She not only is an amazing athlete but also is an amazingly bright student that can juggle her schedule perfectly,” said senior and teammate Bella Baldridge. After completing this year at LBHS and hopefully winning another Division-1 title with the girls water polo team, Fischer will continue playing the sport at the next level. “I am verbally committed to Stanford. I also hope to compete in the 2020 Olympics,” said Fischer.